This month I'm going to again focus on another rear leg awareness exercise and a front leg awareness exercise. The first exercise is great for not only rear leg awareness but for building muscle too. Again, just like last month you must remember to do this in both directions, clockwise and anticlockwise. You may find just like humans that your dog will have a weaker side. Don't give up. Work hard and up your game a bit slower. This is an excellent way of training Think what do you want out of the session, Plan the session and then do. This way you know what you want to do and shouldnt accept a left spin if your after, in this session teaching a down. Break the trick down into sessions. I dont plan to achieve a whole trick in one session. id rather the dog understood the movement to the trick, So i up my not up my game twice in one session. 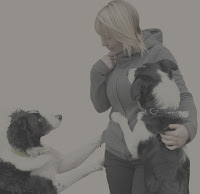 Each box session I do will last for no longer then 5 minutes (Normally 2-3 minutes) I want to finish with the dog wanting more not with them deciding they are no longer interested! You can increase the time if you need to. their front paws onto the box I may show them by showing them a treat. I will then mark the behaviour once in the position. I will mark it followed by a lower value treat. I will then begin to move around the box. I will take one step and then wait to see if my dog offers to move. (with their rear legs, around the box.) I will reward after the first 1-2 steps that they take with their rear legs. If they are understanding this and offering the leg movement I will then up my game. If not I would move around the box myself a bit more. But don't start by making it too easy see what they offer first. Upping the game. Now I am going to only mark and treat the dog for taking 3-5 steps. I will then up my game again and only reward after every full circle my dog makes around the box. Easy? Want to up the game even more? 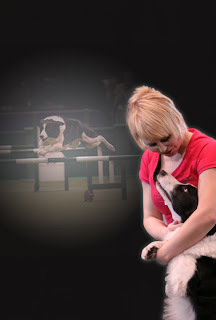 Now see if you can start with your dog on one side (your left) and see if they will offer moving around the circle, (without you moving)all the way round till they are on your right side. Ok so lets swap it about, time for Box Circle trick 2 . You will still need your box upside down but for this one you need your dogs back paws on the box and the front paws on the ground! Below is a picture to show you the position and posture the dogs should and shouldn't be marked in its ok for the dog to sit whilst doing this but keeping them out of a sit and in a stand position makes them think about their rear legs (that stay on the box ) as they will need to move them too when they move around the box on their front paws. If they are in a sit they will twist round and have to raise to change positions anyway once their have moved the front paws have moved ? of the way around the box. I do not reward or mark the behaviour if my dogs are sat whilst doing this or have a sneaky leg off. I will again remember to mark the behaviour once in the position. I will then begin to move around the box. Exactly the same as the first trick. Remember this time your rewarding movement from the front paws which should be on the ground , the back paws should stay on the box. for moving their front paws. * Hold back the reward until the dog moves 2-4 steps, then reward. * Hold back the reward for half a circle, then reward. * Hold back the reward for a full circle, then reward. 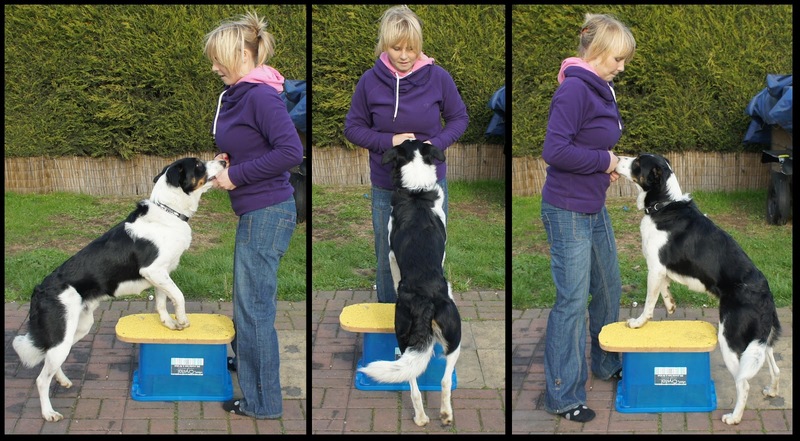 Now see if you can get your dog to move round the box themselves with their back paws on the box and their front paws on the ground. Can you get them to move around the box without you needing to use your hand as a lure or you moving around the box with them.